Those, who know me at least a little bit, are very aware of how much I love Halloween, so every year, when I get to play with my spooky stamps, I enjoy every minute of it! Halloween without a witch is no Halloween at all, that’s why this colourful creation was born. Traditional orange and black for anything Halloween related is a huge favourite of mine, however, I also love other colours associated with this holiday. How can you not love rich purple or bright lime green, right? One of my favourite Halloween paper collections ever is Echo Park’s “Arsenic and Lace” and I thought it’d work really perfectly for this card. As usual, I chose a few patterns that work well together and layered them in such a way that each of them complemented the others. I then mounted my papers on “Black Cat” Core’dinations cardstock. Colourful papers mounted on black always stand out against each other really nicely and is definitely my choice for Halloween projects. I also added some black sheer organza trim with a satin ghost ribbon in the middle for extra texture and interest. The main star of the show on this card is definitely the amazing witch stamp. She’s called “Witch Willa” by Kraftin’ Kimmie Stamps and is by an artist I truly love - Annie Rodrigue. I coloured her using Promarkers/Brushmarkers and then fussy cut her leaving a narrow white outline around the image. I find that the white outline gives the images an extra pop against the backgrounds. I also coloured and fussy cut a tiny frog companion, which came in the same stamp set as the witch. To give him a shiny wet look, I used Glossy Accents by Ranger. I picked colourful papers for my card layout and coloured the stamp in rich, bright tones, so I wanted the background to have the same vibe. As usual, I turned to my trusty “Distress Inks” by Tim Holtz. The shades I used to create my background are Fired Brick, Rusty Hinge, Spiced Marmalade, Mustard Seed and Crushed Olive. I blended the inks to create a colour gradient and sprinkled the area with water to add extra interest. I chose an intricate filigree oval (Joy! Crafts 6002/0304) to display my coloured stamp. I die cut it from the same “Black Cat” cardstock I used to mount my papers. This particular frame can look extremely elegant, but in black it creates an illusion of curly and a bit spooky tree branches or brambles, which is perfect for a Halloween project. For the middle - I cut out an oval out of the previously prepared inked background, glittered its edges with Stickles in “Orange Peel” and glued it to the filigree frame. Then, using 3D foam, I adhered the frame to the card and the stamp in the centre of it. I just love that good-natured ghost ribbon, so a little strip of it was never going to be enough. It is only 9mm wide, therefore, I created a triple loop bow and added a glitter Jack-o-lantern button by Dress it Up in the middle. 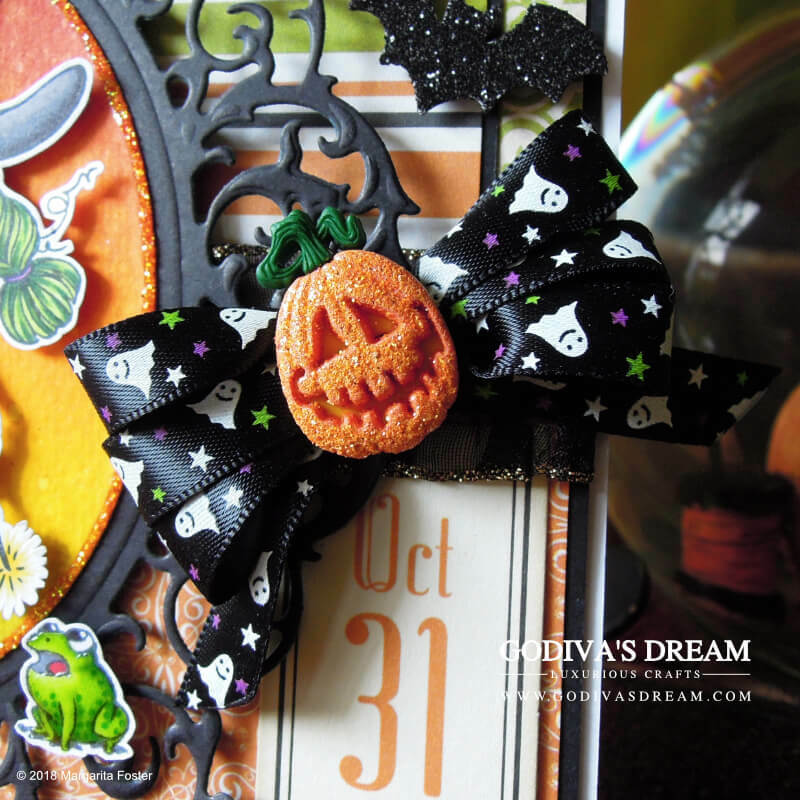 The pumpkin suits the Halloween theme perfectly and adds to the different textures on the card. In order to decorate the opposite side of the card, I picked various mulberry flowers in complementing colours and differing sizes. I also added a miniature broomstick (for all witches need one, right?) and a tiny potion bottle of chunky lime green glitter. I’m a big fan of cards that have so much on them, it takes a few moments to discover all the interesting embellishments. To finish off my card, I added a “Happy Halloween” banner at the top of it and a glitter bat. Both of these were mounted on 3D foam for dimension. Under the bow, I also adhered an “Oct 31” pennant, it just looked perfect there. Are you a fan of Halloween? Do you create many Halloween projects? Tell us all in the comments.